EUR/USD, the euro is alive! 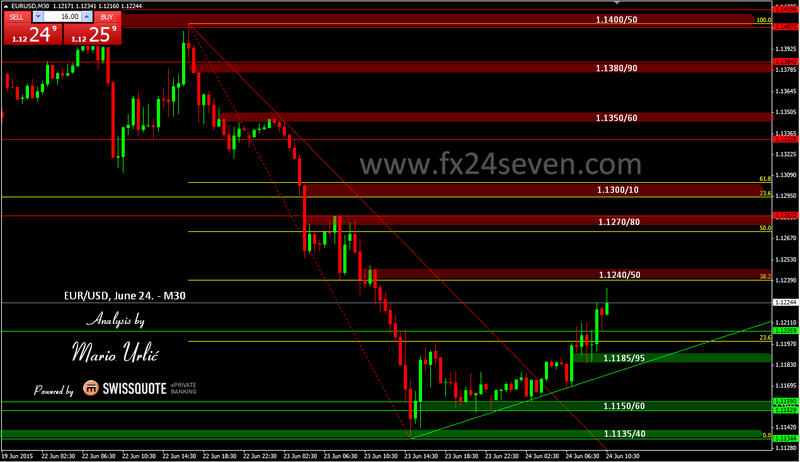 The pair has recovered from the lows and reached 1.1234 high for now. I point this 1.1150/60 yesterday in my analysis as possible support and reverse point. You can see, that the pair has struggled with the 1.1200 level in the morning, but it manage to brake it and now is aiming to 38.2 fibo return of the yesterday’s sharp fall. 1.1240/50 is next level to watch and there is much more to come above. Yesterday’s fall was easy true the all support levels, MA’s, like there was no buyers at all, let’s see how will sellers react today. There is US GDP coming up today at 12:30 h (GMT), Greece is on the line as well, much important news for the market. Watch this levels and create your trading strategy base don technical levels, it’s always works. This will be the hard work for the bulls!